Apologies for the delay in the publication of the second part of our review of the Cycle Show but the events of last weekend sort of changed our focus a bit! In the second article we'll be looking at the non-bike brands which were exhibiting new stuff that caught our eye at the show. Part three (yes, there's more...) will take a look at the brands who weren't there and highlight what you can expect for the coming season. It's no secret that we like Garmin kit - it really does deliver on its promises - so it was nice to catch up with their two latest models; the Forerunner 50 and the Edge 605/705. The new Forerunner doesn't do GPS, but it is a great sports watch that's more than a match for the equivalently priced Polars. It's party trick is that it comes with a little ANT+ (aka Bluetooth) dongle that means whenever it gets close to your PC it will automagically transfer the data across and upload it to the new Garmin Connect site. 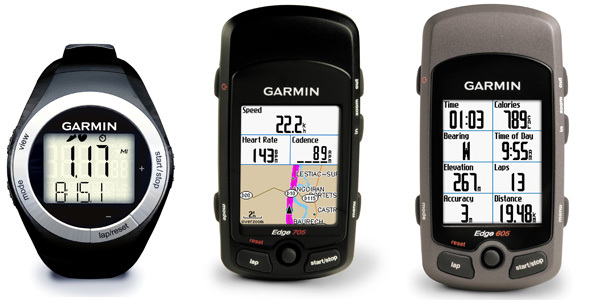 Garmin Connect is going to replace MotionBased as the repository for all Garmin uploads, the Forerunner 50 is the first device on the service but it will be rolled out across the range over the next few months. The Forerunner 50 comes as a watch plus footpod, a watch plus heartrate strap or as a bundle with both. You can also add a bike speed and cadence sensor. It's waterproof to 30 metres, does heart rate zones and has all the other basic stuff you need to get in some serious training data. The pricing starts at around £70 for the base model and goes up to around £120 for the bundle deal and remember, that includes a full download capability which, in our opinion, makes it a blinding deal for an early Christmas present. What you'll want (what you'll really, really want...) for Christmas is the Edge 605/705. We do all our bike training with an Edge 305 and also use it to capture most of the Route of the Month data but we have the funny feeling that it's going to take a back seat when we get hold of one of the new ones! This has all the same lovely functionality but adds a bigger colour display that can show real maps and it can interface to an SRM crankset so you can get power data as well. Now there's a training lab you'll actually want to work out on, and no need for a chase car any more as they can store around 15 hours of data on a single charge. Bewildering would probably be the easiest way to describe the range of aerobars that you can assemble from Oval's kit of parts! So comprehensive is the range of possibilities that they actually have a poster-sized chart to cover all the options. 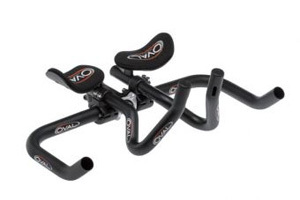 If you want to spec the bars that you want - as opposed to working with a standard set of pre-defined clip-ons or all-in-ones then Oval is the brand you want to look at. Ignoring the all-in-one options for the moment, you get a choice of alloy or carbon drops, alloy cow horns or alloy aero base bars. See why we left out the all-in-ones? Now, because the heart of the Oval design is the reverse-bolted stem where the bolts terminate in the stem cap rather than passing through it you can mix and match the fittings to suit your preferences. You can have the extensions under or over the base bar, you can have armrests or not. You can have the clamps in alloy or carbon-wrapped. You can have the arm pads in alloy or carbon. There are three different pad thicknesses. You can have the extensions in alloy or carbon; in straight, S, single or double bend... Enough already!!! The price of such flexibility isn't bargain basement, and you probably weren't expecting it to be, but it's well within the realms of sensible given the degree of personalisation you'll achieve. Allow a couple of hundred pounds and you'll have a really spot-on set-up with the knowledge that it's built to survive Pro Tour abuse and has more palmares to its credit than any other brand. 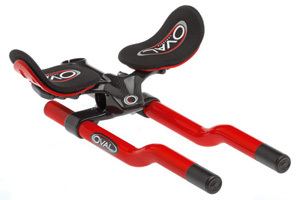 And, just in case you didn't want the total flexibility of the clip and clamp system you get almost the same level of adjustability in their all-in-one systems plus the advantage of built-in aero brakes and either flat, JetStream or 'dropped' JetStream configurations. Question, what's the most expensive groupset out there at the moment? The answer isn't Shimano's Dura-Ace (~£740) or even Campagnolo's Record (~£1,080) but SRAM's Red - at a truly wallet-busting £1,570. Of course, that's if you can get it... There were rumours that, outside the Pro peloton, there were only a handful of actual groupsets out there which were being passed around the various bike companies to be built onto their display bikes and then stripped off to be passed on to the next in line! In case you need to ask what's so great about it that it costs so much just remember the golden rule; the more you pay, the less it weighs... ...Red is a sub-2kg groupset - that's light! The lower-priced Rival and Force groupsets have started to permeate the market during 2007 as an alternative to the standards from Shimano and Campagnolo and, according to those that have used it, their 'DoubleTap' shifting system works well enough once you've learned the technique but unlike switching between, say, Shimano and Campag, you really do have to remember that there is just one lever and it works in just one way if you happen to ride bikes with more than one component supplier. One interesting 'advantage' of SRAM as an alternative to Shimano is that the cassettes and chains are interchangeable - unlike Campagnolo. This means that you could swap wheels around between bikes and know that the systems would inter-operate reliably. It also gives you a different set of cassette options to choose from should you want something different to the stock Shimano ratios. Ask pretty much any aspiring triathlete to name the wheels he would like to buy and the answer will be Zipps. With an already established range covering everything from lightweight climbing wheels to full disks it's hard to see what they could add to the options that already exist - but they have! For those who want a disk but don't want that solid wall of material and all the potential handling issues that go with it there's now the monstrously deep 1080s. Designed in answer to the calls for something even more extreme than the 808, these are the Polo mint of the disk world - yes, there's a hole in the middle... Tested against the benchmark of a trispoke over 40k, these 105mm deep rims lopped 29 seconds off the time and weigh less too. For the disk wheel afficionados, Zipp have introduced the Sub-9, a wheel that can actually create lift when the wind is in that 'up to 30°' section. In essence they seem to have put the solid bit back in the middle of a 1080 where it acts both as a 'sail' to generate the lift and as a spring to dampen out some of the harshness that riding a solid wheel brings to the party. The wheel also incorporates their new Carbon Bridge technology to help spread the impact load on the rims. Eventually this will be included across the range on both tubulars and clinchers and is a series of Kevlar threads which stitch the sidewalls and the 'bridge' section that sits across them and forms the base for either the tubular tyre or the alloy clincher section. The Kevlar threads help to distribute impacts throughout the whole structure rather than keeping them localised - it probably doesn't make them bulletproof but anything to ease the pain of wrecking a set of wheels on a pothole has to be a good idea.